It’s simply not possible to visit glorious Venezia without a little gastronomic adventure. When I stay in Venice, I prefer to experience the daily rhythm of Italian life off the beaten touristic track. One of my favorite passatempi (pastimes) while in Venice is the nightly Giro di Ombra, the Venetian equivalent of a pub crawl. While the origins of the phrase are debatable, the most plausible explanation is as follows: Years ago a small bar setup in the shadow (the ombra) of the church tower on San Marco square late in the afternoon, just before dinner. The bar served small glasses of wine and tasty local snacks to hungry Venetians on their way home from work. As the sun traversed the sky, the cart would track the shade of the clock tower — hence the phrase giro di ombra, or a “turn of the shadow.” Works for me! Modern day Venetians still participate in this age old tradition by visiting the many small, quaint bars called bacari (from the word Bacchus, the Roman god of wine), sprinkled liberally throughout the historic center. Each night small groups of locals (and tourists in the know) travel a circuit of local bars, ordering at each stop an ombra (a small glass of wine) and munch on cicchetti, a small snack that is distinctly Venetian. Cicchetti can be small fried fish, olives stuffed with sausage, baby octopus on a toothpick, or francobolli — tiny postage stamp-sized sandwiches. It’s a pleasant way to loosen up after a long day at work (or shopping). 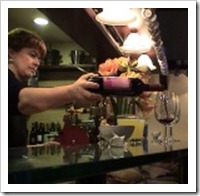 Traditionally, the wine served as an ombra is sfuso, or loose wine, — think respectable plonk. At most bacari these days you can try dozens of quality wines by the glass for just a few Euros. Your giro di ombra is a great way to inexpensively taste a great many Italian wines, without having to travel to VinItaly. While Venice is known for many things, haute cuisine is not one of them. Stories abound about the touristy restaurants that are more interested in helping you part with your money than sharing the elegant culinary treasures of the Veneto. I follow three simple rules when it comes to dining in Venice: 1) never eat at a restaurant with multi-lingual menus, 2) don’t eat fish on Sundays or Mondays (the Rialto fish market is closed, so fish dishes aren’t fresh), and 3) find restaurants filled with locals. To reduce the risk of bombing-out on an evening’s meal in Venice, I always refer to the listings in Osterie d’Italia, a foodie’s dream guidebook to the most genuine and honest restaurants in Italy that cook in the local style. 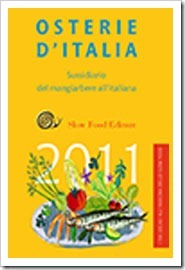 Published and updated annually by the staff at Slow Food, this 800+ page guidebook is your ticket to excellent food and wine in a convivial atmosphere. This year our trusty guide features 8 osterie (small, family-run restaurants) and 13 enoteche (wine bars) in the Venice area, all serving purely local cuisine and featuring wines of the Veneto province and nearby Friuli Venezia-Giulia. Over the years I have dined at them all save one: a small, out-of-the-way restaurant in the city of Mestre where the long causeway connects Venice to the mainland. Frankly, Mestre is not the kind of place you would want to spend time in, but Ostaria da Mariano just might redeem the sprawling industrial town. On a recent trip to Venezia, my wife and I grabbed a cab at Piazzale Roma and headed for the mainland. We arrive at Ostaria da Mariano just in time for our 1 PM lunch reservation. The owners greet us warmly and immediately seat us. Not a tourist in the place — score! We settle in for a pleasant 2 hour lunch under the gentle guidance of Antonio and Nadia. Like many genuine osterie, there’s no menu — you eat what’s cooking, which is almost always what is immediately in season. When in doubt, we ask the server which dishes he personally prefers. Today we can count on Antonio to share with us the day’s best from the kitchen. The prize for the day is the seppie in nero, or braised cuttlefish (think squid) served in a sauce made from its own ink. While it sounds a bit strange, it is a truly fantastic cucina tipica dish from the Veneto region. "We start with an onion soffrito and braise the cuttlefish very slowly, occasionally adding a few tablespoons of water and vegetable broth while it cooks," says Antonio. "As the cuttlefish becomes tender, we add a small pinch of cinnamon and the ink." Served with white polenta made from mais biancaperla, a Slow Food Presidia corn variety, the seppie in nero is out of this world. The black-as-night sauce is rich, round and soft, very earthy while the seppie is tender and delicate. It’s a must-try local staple while visiting Venice. Leaving our appetites in the caring hands of Antonio, we’re treated to wave after wave of additional Veneto specialties, like pasta e fagioli, baccala mantecato (salt cod in a delicate mayonnaise-like sauce), and sarde in saor (sardines with pickled onions, raisins and pignoli). We close with a dessert of sweet wine and little S-shaped cookies called esse, knock back an espresso, and bid our hosts a gracious thank you for their unending hospitality. Visiting Ostaria da Mariano. While staying in Venice or if you’re passing through the area, Ostaria da Mariano is an easy and worthwhile stop to satiate your hunger and sample some fine Veneto wines like Valpolicella, Amarone, and other regional specialties. From Venice take a taxi from Piazzale Roma or save a few Euros by taking bus #4 and step off at the Via Ca’ Rossa stop, about 15 minutes. If you’re coming by way of train, stop at the Mestre central train station and take a taxi. They’re located at #49 on via Spalti. Antonio and Nadia can be reached at +39.041.615.427, or via email at da_mariano@libero.it. They’re open for lunch after 12:30P and most evenings. Reservations are recommended, have your hotel make it for you. Where to stay in Venice. You’ll find a gaggle of fine hotels ranging from € 60 to € 600 sprinkled throughout Venice. Just pick up a reputable guidebook (see my posting Traveling the Italian Wine Route, Part 1: Planning Your Trip for recommendations) and select one that meets your financial and location needs. We like to stay with our friends Roberto and Piero who run Pensione Guerrato, a small 600 year-old hotel just off of the Rialto bridge and a stone’s throw from the Rialto fish and produce market that teems with locals Monday through Saturday mornings. Roberto and Piero also rent small apartments if you’d prefer to live come locali (like a local) while you stay. You can reach Roberto and Piero via email or phone them at +39.041.528.5927. Know a good place to stay or visit while in Venice? Have a favorite story or experience to share from a recent trip? Join the conversation and don’t be bashful, we’d love to hear your thoughts. If you have a question about Italian wine, food or travel, ask away. On a recent trip to Venice, our restaurant served us a plateful of after-dinner “esse” cookies. They were outstanding, and I’ve been looking ever since for a recipe. If you have one, I’d appreciate receiving it. Thanks.